This book provides a simplified description of Bluetooth technology, services, and profiles. You will find out how Bluetooth devices automatically locate nearby Bluetooth devices, authenticate them, discover their capabilities, and the processes that are used to setup connections with them. This diagram shows the basic radio transmission process used in the Bluetooth system. 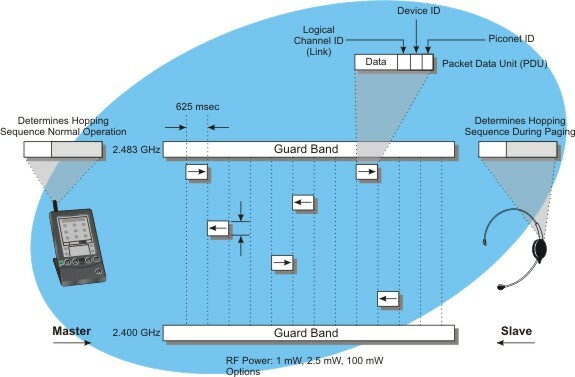 This diagram shows that the frequency range of the Bluetooth system ranges from 2.4 GHz to 2.483 GHz and that the basic radio transmission packet time slot is 625 usec. It also shows that one device in a Bluetooth piconet is the master (controller) and other devices are slaves to the master. Each radio packet contains a local area piconet ID, device ID, and logical channel identifier. This diagram also shows that the hopping sequence is normally determined by the master's Bluetooth device address. However, when a device is not under control of the master, it does not know what hopping sequence to use to it listens for inquiries on a standard hopping sequence and then listens for pages using its own Bluetooth device address. This figure shows the different types of sleep modes used in a Bluetooth system. This diagram shows that the master control the sleep modes of the devices within the Piconet. In this example, the master in the Piconet commands a PDA to one time sleep period (hold mode) for 500 msec. 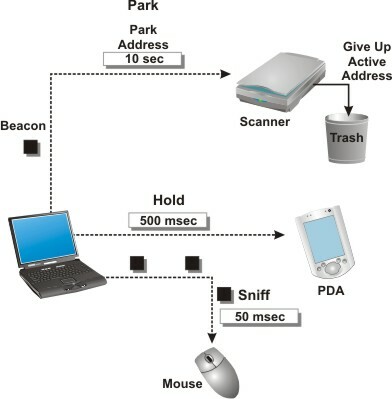 The master then commands the mouse in the Piconet to sleep periodically (sniff mode) for 50 msec. The master then commands the scanner to give up its active member address wait until 10 seconds before it will again communicate with the scanner. This figure shows how profiles are used to standardize how Bluetooth devices communicate with each other independent of who manufactured the device. 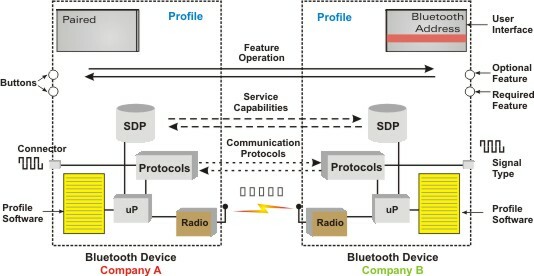 This diagram shows that profile includes the required communication protocols, the service capabilities, and feature operation of the Bluetooth device. In this example, the Bluetooth profile also defines how the user can interact (features and optional features) with the device and how the device will display information to the user. Mr. Lawrence Harte is the managing director of Althos, an expert information provider covering the communications industry. He has over 29 years of technology analysis, development, implementation, and business management experience. Mr. Harte has worked for leading companies including Ericsson/General Electric, Audiovox/Toshiba and Westinghouse and consulted for hundreds of other companies. Mr. Harte continually researches, analyzes, and tests new communication technologies, applications, and services. He has authored over 30 books on telecommunications technologies on topics including Wireless Mobile, Data Communications, VoIP, Broadband, Prepaid Services, and Communications Billing. Mr. Harte’s holds many degrees and certificates include an Executive MBA from Wake Forest University (1995) and a BSET from the University of the State of New York, (1990). Mr. Harte can be contacted at LHarte@Althos.com. This book explains provides a simplified description of Bluetooth technology, services, and profiles. You will find out how Bluetooth devices automatically locate nearby Bluetooth devices, authenticate them, discover their capabilities, and the processes that are used to setup connections with them. Discover how Bluetooth’s spread spectrum technology allows it to operate with other devices operate including wireless LAN, microwave ovens, cordless telephones, wireless video cameras and how the Bluetooth specification now allows devices to adapt their frequency transmission to avoid interfering with these devices. You will learn about the discovery (inquiry) phase and the connection (paging) process that devices use to find and connect to other devices. The modulation types and packet structures are explained along with how the use of multislot RF packets can dramatically increase the data throughput between devices. Learn how enhanced data rate (EDR) can increase data transmission rate from 1 Mbps to 3 Mbps. The protocol layers are explained including the RF baseband (physical), link manager, L2CAP (transport), and upper session and application layers. You will learn about the many Bluetooth profiles that define the services and applications that Bluetooth can provide. Bluetooth security processes such as pairing (authentication) and privacy (encryption) and how the new simple pairing process is described.